This picture of the spectacular southern spiral galaxy NGC 300 was taken using the Wide Field Imager (WFI) at ESO’s La Silla Observatory in Chile. It was assembled from many individual images through a large set of different filters over many observing nights, spanning several years. The wispyarms of a spiral galaxy similar to our own Milky Way can be seen in strikingdetail in a new image from the European Southern Observatory. The manyenergetic star-forming regions along NGC 300's spiral arms arevisible in the picture as red and pink clouds.? 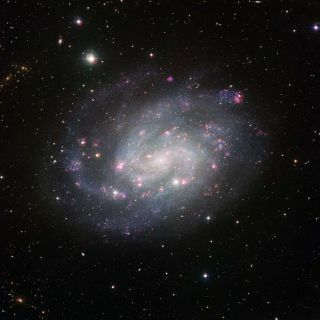 The image,which was taken with a 50-hour exposure, gives a clear view of NGC 300'sstructure and shows the apparent size of the galaxy, which is about two-thirdsthe size of the full moon against the sky. NGC 300 wasdiscovered by Scottish astronomer James Dunlop, who spotted the bright galaxy fromAustralia in the early 19th century. As a relatively nearby galaxy that isquite prominent in the southern skies, NGC 300 actually can be seen with regularbinoculars. The galaxyis located in the constellation Sculptor, which contains a few bright starsbut is made up of a collection of galaxies that form the Sculptor Group. Otherknown galaxies that belong to this group include NGC 55, NGC 253 and NGC 7793. The newimage was assembled from a series of separate images that were taken throughdifferent filters with a total exposure time of close to 50 hours. Theresulting data were collected over the course of many nights of observationthat spanned several years. Theextensive observational campaign was part of a larger effort to assemble acensus of the stars in the galaxy. Astronomers wanted to count the number andvarieties of the stars while singling out regions or individual stars for morefocused examination. In a recentdiscovery by ESO astronomers, one of the most massive black holes was found in the galaxy, and it wasdetermined that NGC 300 and another galaxy, NGC 55, are slowly spinning aroundand toward each other, in the early stages of an eventual galactic merger. By studyingthe structure and content of NGC 300, astronomers can get a better idea ofother characteristics of spiral galaxies like our own Milky Way.